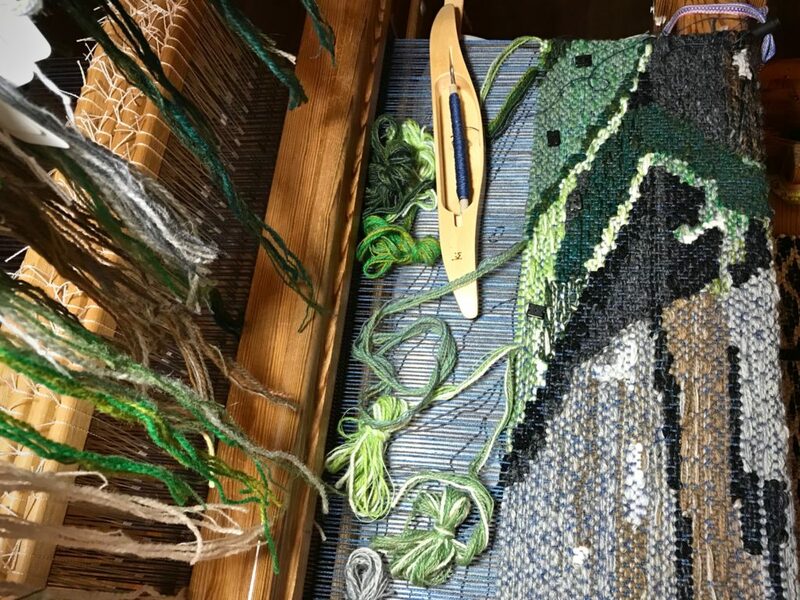 I started the Lizard tapestry right before our big disruption. 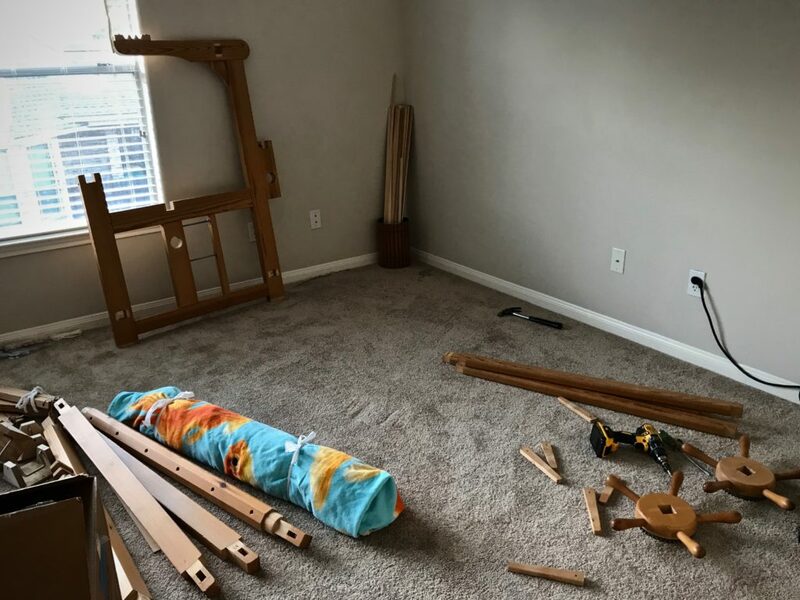 Selling your house means that every in-process project instantly becomes vulnerable. Yikes! After a sleepless night, I contacted my friend Joanne Hall. Can this weaving be saved? Yes!, she assured me, as she gave me instructions for dismantling the loom. Yarn supply is packed up, including all the wool butterflies. Everything is logical about the process. Undo things, tie parts together, take things apart. 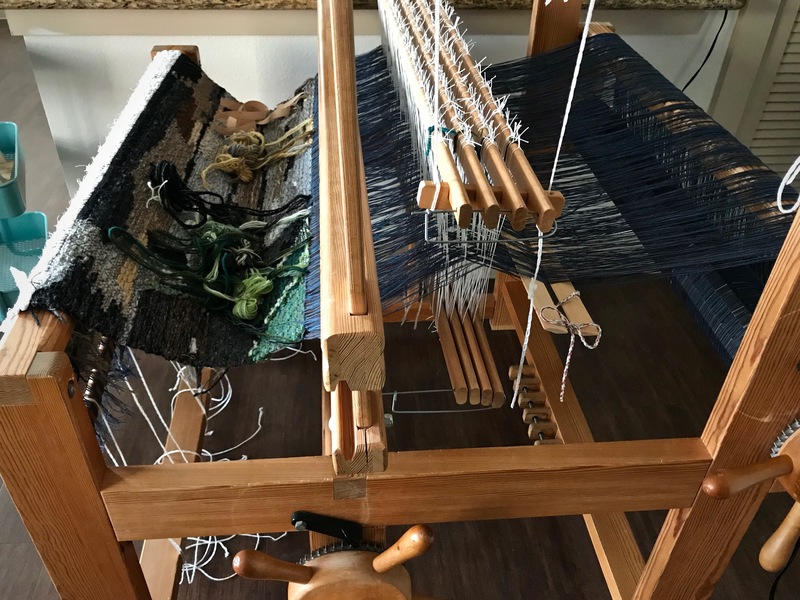 And I don’t have to cut off the weaving? No. Remove the beam cords from the cloth beam. It’s that simple. Lamms and treadles have been taken off. 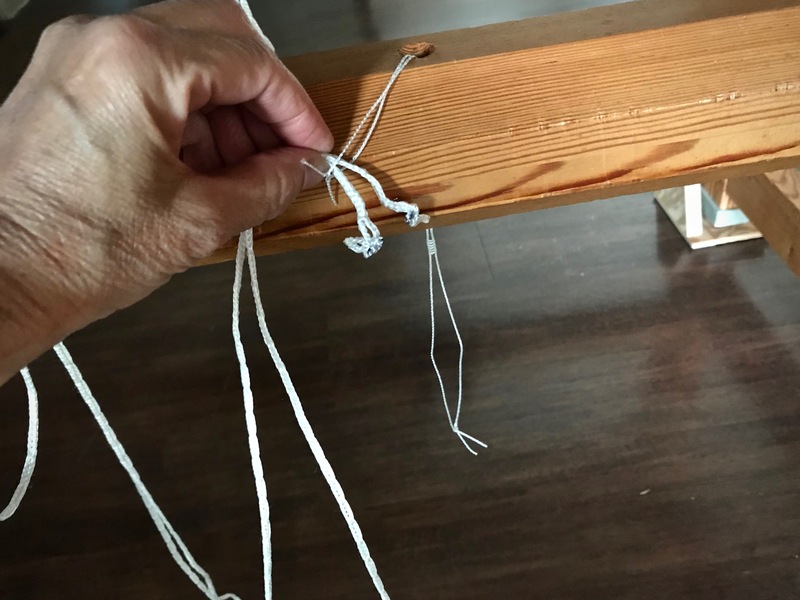 Beam cords are removed from the cloth beam. Taken apart. 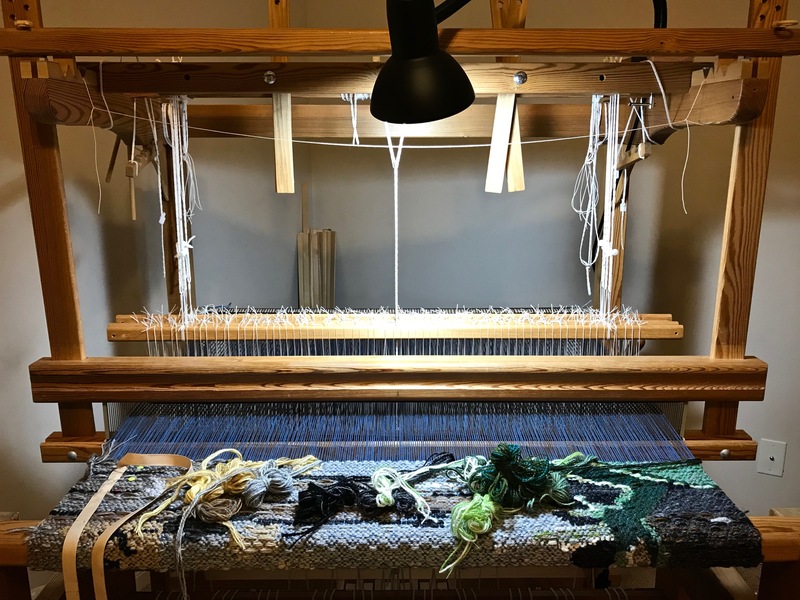 Tapestry, reed, and shafts are rolled and bundled up in the fish beach towel. Everything fits in the car, ready for transport. 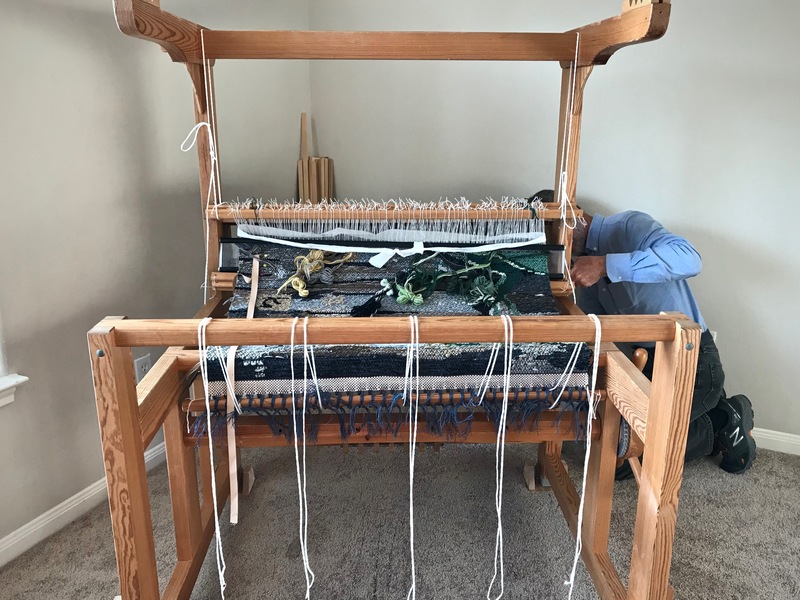 All the dust has settled, the house transaction is done, and the loom has been re-located and put back together. It’s the first thing you see when you enter our ground-floor apartment. 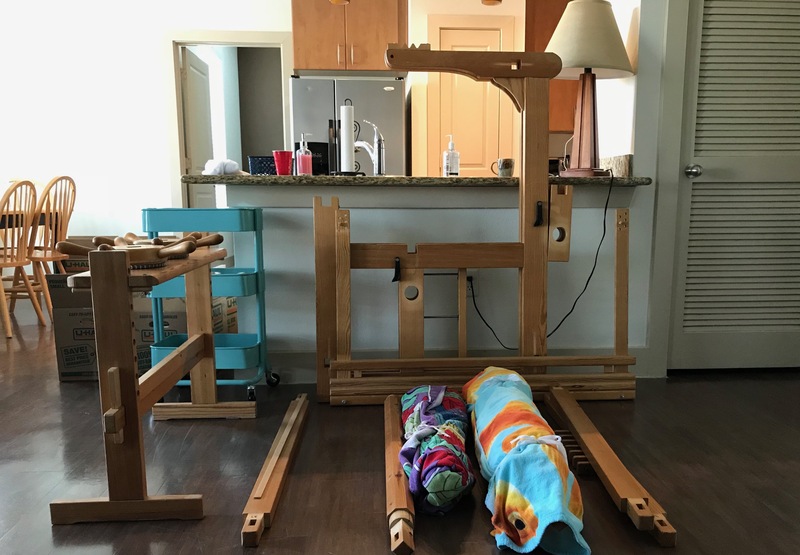 New location for the loom is in the living room of our apartment. 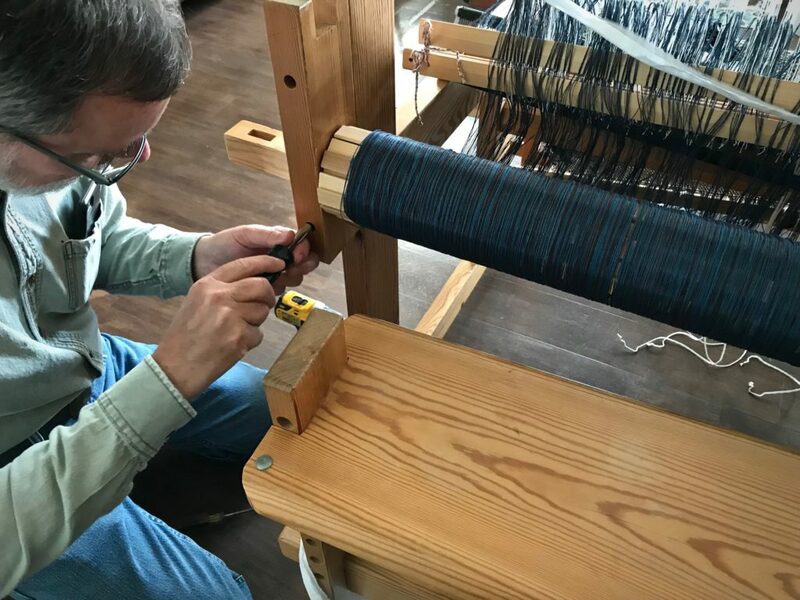 Re-attaching the bolster to hold the warp beam. Spare Texsolv heddle works as a cord threader (I forgot to pack the “real” cord threader) to re-attach the cords on the cloth beam. What about the Lizard? Can I resume where I left off? Good news: IT WORKED! Everything is put back together. Beam cords are re-attached. Yarn is unpacked. Warp is tensioned. Lizard foot grips the breast beam as weaving resumes! When have you had to wait? Something you dearly long for is unreachable for a while. Waiting for the Lord is always waiting with hope. I trusted my friend’s advice. So, my hope was strong while I waited to see this lizard take shape again. In a similar way, I can trust the Lord when there is a disruption. Wait with strong hope. Wait for the grace to begin again. It looks like your move went pretty smoothly. Your tapestry looks so fun. I look forward to seeing completed. I treasure your posts. Hi Kay, It didn’t feel smooth while we were in the midst of it all, but now that things are relatively quiet again, I guess you’re right— It did go pretty smoothly. This tapestry is fun indeed. I’m looking forward to long uninterrupted sessions to enjoy it! Thanks, Beth! It is a huge relief. Joanne is such a help! I took my Julia from TX to WI for a workshop last May and went through the same process using her instructions. 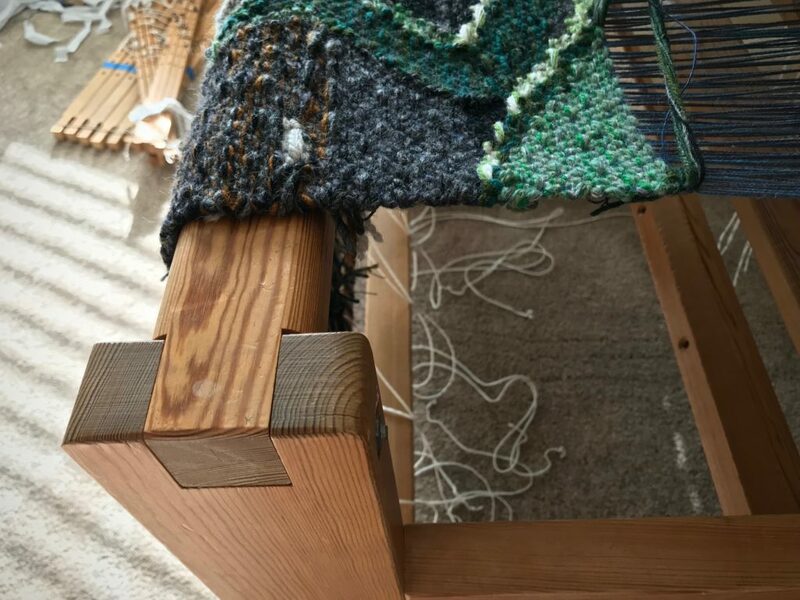 At least I didn’t have to worry about a project, just the header had been woven. The Julia gables come apart, so everything fit in a box except the back uprights. So cool. I will be looking forward to seeing that lizard emerge further. 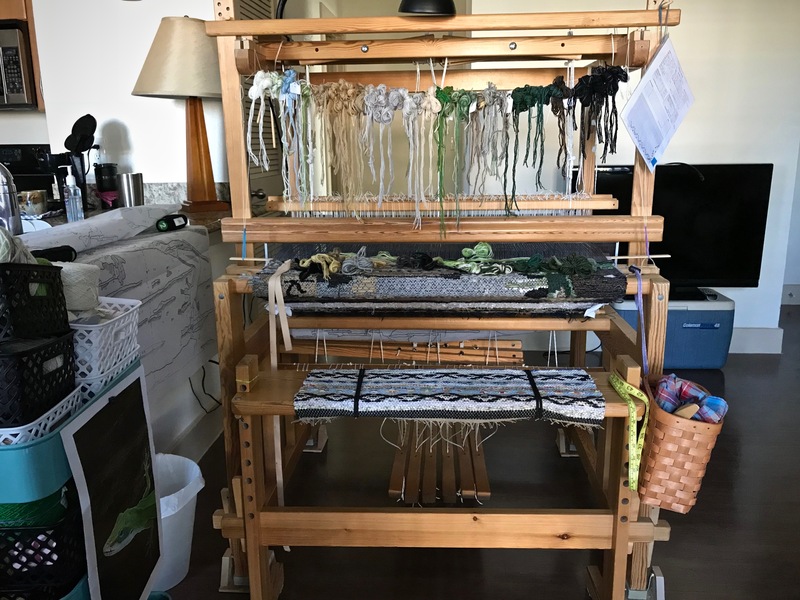 Betsy, Sounds like the Julia is a perfect workshop loom! Joanne has a wealth of knowledge and experience. It’s sweet that she is so willing to help. This lizard is going to get a lot of my attention in the next few weeks. I set up my new to me home made floor loom at a weekend house. 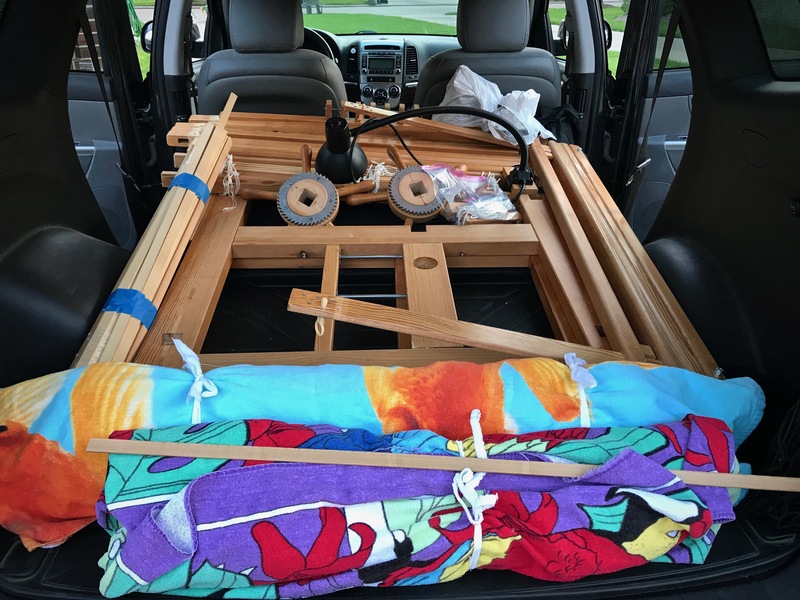 There was 12″ of my first project on it when we decided to sell that house and look for our future retirement home. As it was dismantled each connection was marked with the same number using a sharpie. When it was put back back together 1 was matched up with 1… and so on. Now it is set up to dismantle and take anywhere. 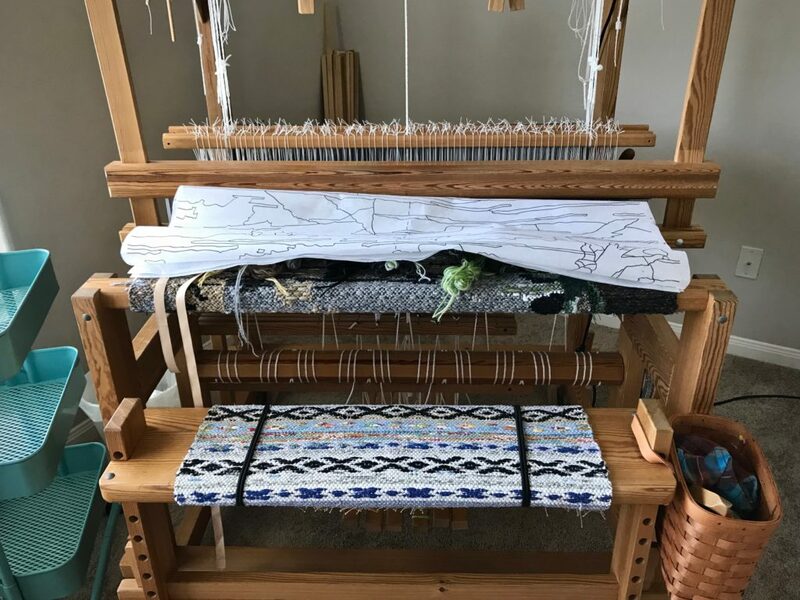 The people who designed looms were remarkable inspired. 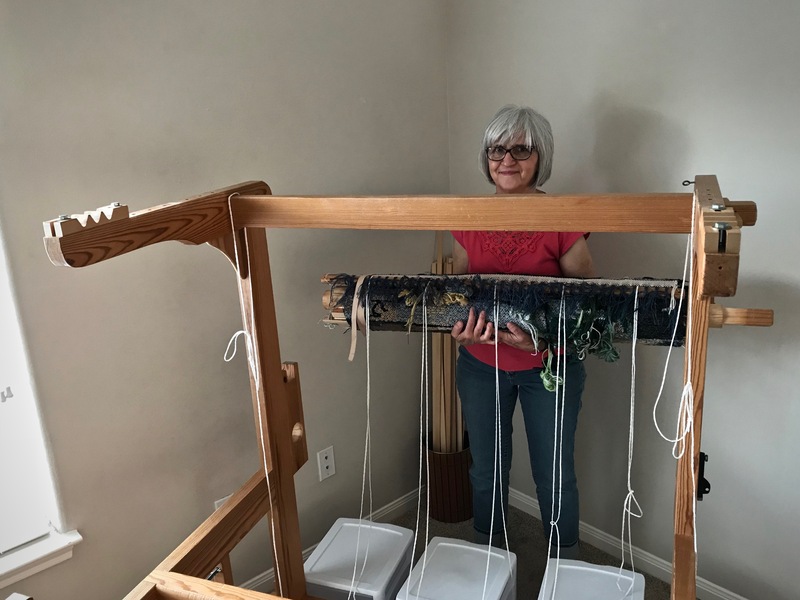 Hi Nannette, Yes, it’s remarkable that we can so easily take looms apart and then put them back together again. I love the advice to “Wait with strong hope.” There are times when that advice is sorely needed. I, also, look forward to hearing about your adventures, Karen. And this one was a big one! It is a good thing that your apartment has a large living room! May you enjoy your temporary home. Hi Annnie, I, too, often need a reminder to wait with strong hope. When things are difficult, hope can begin to waver. Thank you for for your posts, I have learned so much by reading them. And right now, just what I needed to deal with my own transitions. 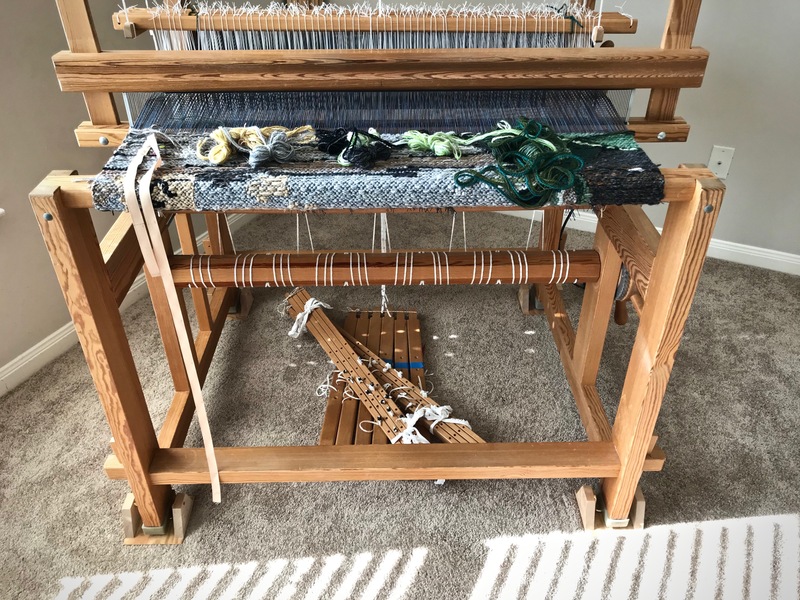 All the decisions and disruptions related to remodeling, selling a loom, and buying a new loom have been weighing me down. I have my eyes on a used Glimakra Standard, but it’s 1,800 miles away….. 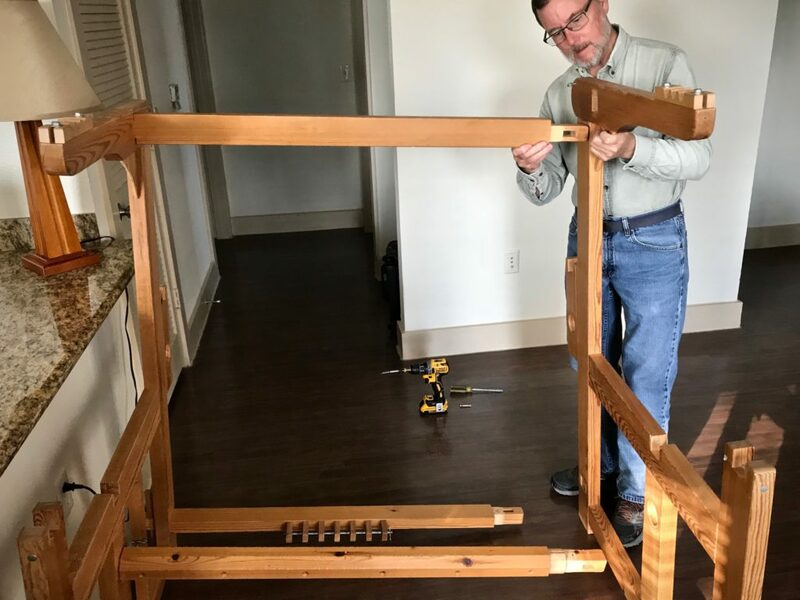 The pictures of moving your loom have been very helpful. Perfectly put, I can now wait with strong hope. I’m happy that your move has gone so well & you are temporarily settled. Hi Barb, I do understand the impact of life transitions. It can be stressful when you’re in the middle of it! I’m glad to hear that you are holding onto strong hope. Remember, just about everything is temporary.